HJOC Builds New Bridges with the IgnitionWeb Platform. HJOC is a 100% wholly-owned firm and leading supplier to Canada's resource industries specializing in heavy civil infrastructure construction, mining applications, and energy development. Established in 1937, the firm has a rich history in the heavy civil engineering/construction industry and ranks among Canada's oldest such companies. 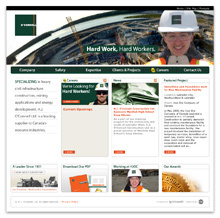 To capitalize on their position as trusted leaders in their field, their striking corporate colour (orange and green) are used as the basis for the entire design concept. 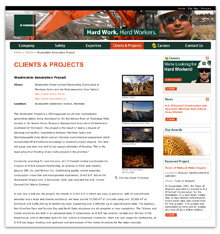 In 2003, HJOC needed an informative and user-friendly website to make an impression online. The site was geared to increase revenue, decrease communication costs and improve relationships with customers, joint venture partners and employees. The HJOC website had served the company well for over seven years. However, times are changing, and HJOC is fortunate to be expanding faster than they can recruit personnel to meet demand. In 2010, HJOC was interested in taking their Web property to the next level while still maintaining the integrity of their legacy content and existing system infrastructure. Since HTC designed the original site to be scalable, our client's demand for additional functionality was seamlessly integrated into the IgnitionWeb-driven framework. We were also tasked with updating various Website components. For this effort, a new usability-enhanced navigation system was created and a refreshed Web 2.0 look was designed. Additionally, new features, such as the ability to add new projects and upload new header images were integrated into the underlying IgnitionWeb system, improving HJOC's ability to administer their website in-house. HTC developed Projects Manager to create an online catalogue of HJOC project case studies—allowing administrators to add or edit images and descriptions, presented on the public-facing website in attractive lightbox slideshows with enhanced Search Engine Optimization. Our 2010 work began with the most sophisticated implementation of IgnitionWeb's Careers Manager module ever. HTC enhanced almost every aspect of the Careers Manager system, which also included the development of powerful new tools such as Application History, Profile Modification, and Job applicant log-in functionality. HJOC is now equipped with an extremely powerful, yet easy-to-use online recruitment system. Built in 2003, HJOC's website features enduring design that has withstood the rapidly-changing Internet landscape to look fresh and current to this day. When HJOC celebrated their 75th anniversary, HTC created a commemorative multimedia and branding package to highlight their achievements. Since building their original site, HJOC has joined the licensing program and upgraded its IgnitionWeb back-end to keep the technology behind its site as powerful as the design up front. The 2010 updates have facilitated HJOC's online recruiting capabilities. Beyond that, HTC was able to take customized, dynamic project management to the next level. HJOC also has more control over its entire site from header graphics, to content—leading to optimized internal processes, improved communications, cost reductions and the ability to focus on what makes HJOC profitable.